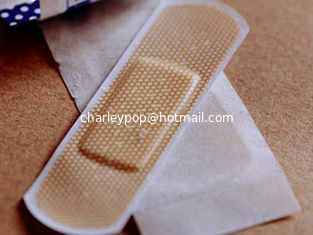 First aid bandage, a kind of medical bandage, also called band-aid, made of cotton fabric, elastic fabric, non-woven fabric, PVC sheet, PE sheet, PU film, or EVA sheet, medical grade adhesive coated. Various shapes with square edge or round edge. White or skin, or any other colors. It is hypoallergenic, latex free, good sticky, and good absorbency. Some types are waterproof.